One of the most challenging yet necessary aspects of determining employee compensation is categorizing or benchmarking the positions in your organization. By using reports and data to benchmark your jobs, you can establish anchor points which represent the breadth and depth of your organization’s positions. 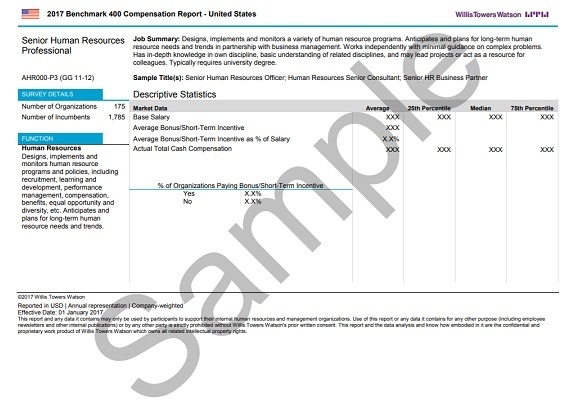 You can then use these anchor points to match to the industry standard and compare employee responsibilities, job level and compensation to ensure your organization’s compensation programs remain competitive within the market. When evaluating a benchmarking report or tool, you should consider reports that include three key elements: job descriptions, alternative job titles, and leveling descriptions. Here are three steps to take as you use reports to get the most accurate, high quality compensation data. Step 1 – Use the benchmark description to determine the match. When determining if a benchmark is an appropriate match, it is important to remember that selecting a benchmark based on the title is not sufficient. Job titles and their responsibilities can vary across every organization and as a result, do not provide a clear depiction of the role’s scope of work. Therefore, it is important to carefully read the job description to ensure that all aspects of the role are fully captured. Usually, if the description describes eighty percent of the responsibilities and skill set required for the role, it is deemed a good match. Step 2 – Review additional information available about the benchmark job. Once you have determined that your job matches at least eighty percent of benchmark description you can then refer to the alternative job titles which identify the type of positions that are typically matched to the benchmark you are considering. These sample titles are representative of the most commonly used job titles across all industries and sizes of organizations. Using both the job description and sample titles ensures that positions with similar responsibilities correspond to the appropriate benchmark. Sometimes there are level descriptions available, which can be used to identify and differentiate between experience levels required for specific roles. The descriptions categorize the roles by management, professional or support jobs. Using the leveling descriptions helps to further narrow down if the benchmark is the appropriate match for your position. Step 3 – Review the market data. Once you have selected the appropriate benchmark for your position, you can begin to use the market data. In this report you will find market data including salary and incentives which can be used to do a comparison to your salaries and incentives for your particular roles. The report provides data for the 25th, median and 75th percentile. Also included is geographic differential data. Geographic differential information, allows you to pinpoint the exact market compensation data for your specific metropolitan area or state. To assist in the benchmarking process, Willis Towers Watson has developed the 2017-2018 Benchmark Select Compensation Report. This easy-to-use, off-the-shelf report provides access to high-quality consistent market compensation data for up to 250 common or “select” benchmark jobs. By using the sample titles, job and leveling descriptions, as well as the market data, you can compare your employee’s data to the market data to ensure your organization’s compensation programs remain competitive within the market to attract and retain your key employees. Take a look at our 2017-2018 Benchmark Select Compensation Report and see how our data can work for you.